Kawabata Yasunari was born in 1899 and committed suicide in 1972. He watched Japan open itself to the world, indulge in dreams of empire and survive the ensuing firestorm. His characters were ordinary people: prostitutes, abandoned wives and children. 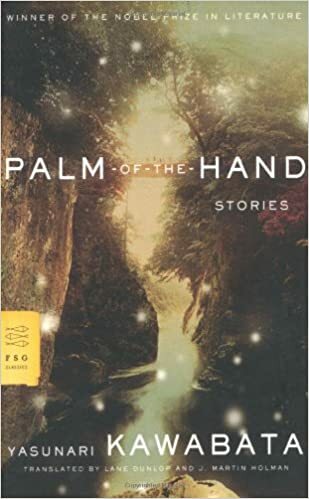 He won the Nobel Prize for Literature in 1968 for his novels but Kawabata himself prized most the abbreviated, intense works of fiction he called palm-of-the-hand stories. The brevity and myriad of themes … are oddly suited to our current age, where communicating as much as we can in the shortest space of time and with the least number of words has become the norm. Palm-of-the-Hand Stories was first published in 1988. Now, almost 100 years after Kawabata wrote the first of his short shorts, this collection remains fresh and relevant. So relevant that when I saw Robert Macfarlane’s Twitter word for 26 May 2018, I had to think of Kawabata. Word of the day: “kawaakari” – the glow of a river or stream in darkness or dusk, the gleaming surface of a shadowed river (Japanese 川明かり). Kawaakari can refer to the reflection of the moonlight off flowing water, or the gleam of late sun at dusk. That sense of a world half glimpsed permeates Kawabata’s earlier short work. As Theodore W. Goossen writes in his Introduction to The Oxford Book of Japanese Short Stories, Kawabata came of age in the first quarter of the century when Japan embraced the world and cosmopolitan thinking entered Japanese literature. That set off a publishing boom but the political undercurrents were too strong. First it was proletarian literature, courtesy of the Russian Revolution. Then, it became fashionable to please an increasingly conservative and militaristic Japanese government. Kawabata did not care for either form of messaging. Nor was he eager to romanticize life. In “God’s Bones” (1927), a waitress gives birth to a child who dies after a day. The mother sends the ashes to the possible fathers: an actor, a restaurant owner and the director of a trolley-car company. The managing director, who’d hurriedly jammed the small white paper box into his pocket, furtively opened it inside the car. Back at the office, summoning the beautiful typist for dictation, he decided to have a smoke. When he reached into his pocket, the box of ashes came out with the pack of Happy Hits. less a story in the usual sense than a node of storytelling, where sounds, textures, tastes, colors, trajectories and intimations are gathered, ready to expand over an empty canvas. Take, for example, this image from “The Younger Sister’s Clothes” (1932). The eponymous sister suffers from a spinal disorder. A corset is ordered to correct the condition. Eventually, the corset was set out to air in a sunny spot on the veranda. Then, when the younger sister took to her bed, the corset was discarded in a corner of the garden. The younger sister became unable to leave her bed. When it snowed, the corset turned white with the rest of the garden. In the two windows carved out in its chest, those round little windows where her sister’s breasts had peeped out, sparrows perched, their heads flicking from side to side in a perfect snowy morning scene. as does a distant storm, with flashes of light on the horizon, and the occasional, almost inaudible rumble. writers could be subjected to imprisonment and ideological “reorientation” if they displeased the authorities by voicing socialist ideas. Indeed, during the last years of the war, works that did not directly support the national effort were banned from publication. This may explain why Palm-of-the-Hand Stories contains no entries for the period 1936-1943. Those that follow this time of silence only glance at war. In “Water” (1944), a woman leaves the homeland to marry a man at a meteorological observation station in Manchuria. In “The Silver Fifty-Sen Pieces”, a girl splurges on a glass paperweight. It is her only possession to survive the firebombing of Yokohama. Life after the war does not improve markedly. In “Bamboo-Leaf Boats” (1950), Akiko struggles with polio. She works to strengthen her shortened leg but stops when Japan loses the war. On a visit to her prospective mother-in-law, she hears the news. Akiko wondered if her fiance had died in the war or if the engagement had been broken off. Was the offer to marry a cripple just wartime sentimentality? After the war, Kawabata vowed to devote himself to the mountains and rivers of the past. Oddly, the late stories in Palm-of-the-Hand Stories are not melancholic. If anything, Kawabata hardened his characters, the way a painter stills his oily brushstrokes under a coat of varnish. At the same time, these later works reveal a younger Kawabata. The would-be painter, the lover of Cubism, Surrealism and Dada. He focused on the fractures only he could see. In “Immortality” (1963), lovers go out for a stroll. She is young and he is old. They are oblivious to this age difference and everything else. “Let’s go.” The girl tugged at the old man’s hand. They tottered toward the great trees. The girl passed easily through the tree trunk. The old man did the same. a disturbing eye, a strange ear, a face transposed against an unexpected background. Kawabata wanted to see through new eyes. When the world changed in ways no one could have predicted, he went on looking. Lucky for us he did. Karen Kao is the child of Chinese immigrants who settled in the United States in the 1950s. She grew up listening to tales of Old Shanghai. 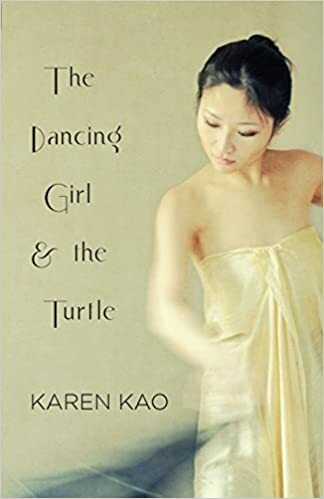 Out of those stories emerged her debut novel, The Dancing Girl and the Turtle, published by Linen Press in 2017. Karen is currently at work on more novels set in Shanghai. Someday she hopes to have four of them and call the collection The Shanghai Quartet. You can read more about Karen and her writing at www.inkstonepress.com.